Since firing Ranil Wickremesinghe, Sirisena has highlighted the personal "shortcomings" of the former PM in a bid to justify the sacking and dissuade the reinstatement of the Wickremesinghe. Mahinda Rajapaksa who was appointed by Srisena has failed to prove his parliamentary majority. Sri Lankan President Maithripala Sirisena has described the ongoing political crisis in the country as one between foreign and local values. "This is an issue between those who believe in foreign thinking and those who respect local values", Sirisena said Sunday, addressing a gathering in his home base Polonnaruwa. The comment was seen as an indirect reference to the United National Party, with whom Sirisena was running the national unity government since 2015. The partnership ended on October 26 when Sirisena fired his Prime Minister Ranil Wickremesinghe, who is the leader of UNP, paving the way for a never-before-seen political stand-off in the island nation. 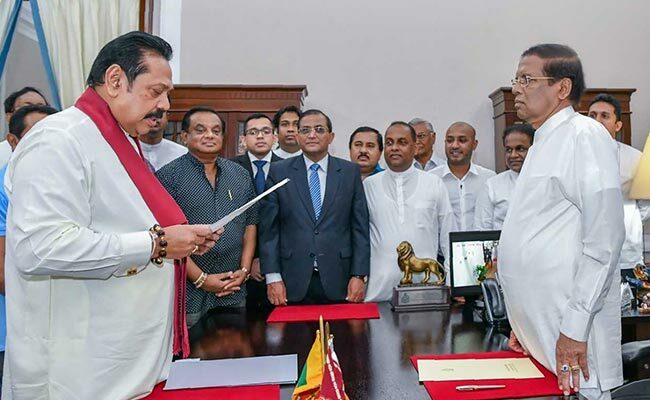 Since firing Wickremesinghe, Sirisena has highlighted the personal "shortcomings" of the former PM in a bid to justify the sacking and dissuade the reinstatement of the Wickremesinghe. However, Wickremesinghe holds on to the official residence of the prime minister, claiming his sacking was unconstitutional. Sirisena later dissolved parliament to call snap elections. Mahinda Rajapaksa, who was appointed by Sirisena to replace Wickremesinghe, has failed to prove his parliamentary majority. The issue is now in the courts, with both the Supreme Court and the Court of Appeal set to deliver judgments on the legality of Sirisena's action. Sirisena said he would decide his next political move depending on the court rulings. He was somewhat critical of the courts' interim rulings which allowed the cases to proceed. Wickremesinghe's allies say his parliamentary majority has been proved several times and Sirisena must restore him in office. The president refuses to do so.